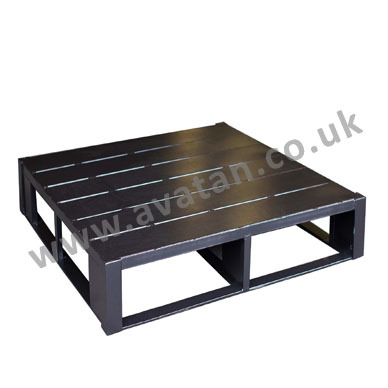 Flat steel pallet, single sided, non reversible, with solid, close boarded or slatted top deck. Four way entry metal pallet suitable for lifting by either fork lift or hand pallet truck. May be stored within pallet racking. Also available with raised lip reducing likelihood of product slippage. 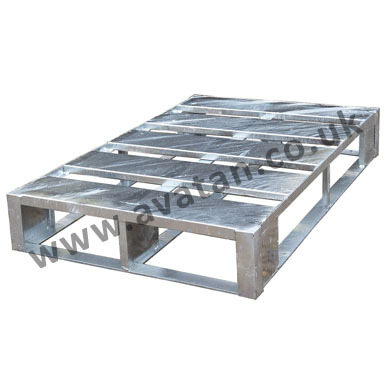 These sturdy steel storage pallets are manufactured to order in all sizes. 1200mm x 800mm Euro pallet size and 1200mm x 1000mm are pictured, painted or hot dip galvanised. Most common standard sizes are 1200mm x 1000mm, 1000mm x 1000mm and 1200mm x 800mm but whatever your requirements, please ask for details.